The first major event for the advertising industry each year is AdFest. Held annually in Pattaya, Thailand, this conference and exhibition draws crowds from all over the region. This year it will be on the 22nd to 25th March, and it is a special year as this is the event’s 20th birthday. A number of Presidents and Jurors, who will be reviewing the entries, have already been named. The latest to be announced is one of Dubai’s most awarded creatives. 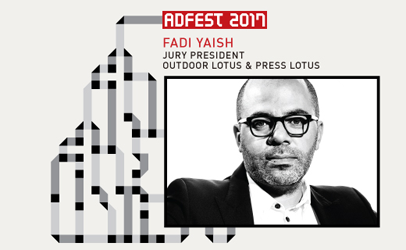 Fadi Yaish will be the Jury President for Outdoor Lotus and Press Lotus. As Regional Executive Creative Director of Impact BBDO, he has helped raise the profile of his agency and the Middle East as a creative hotbed. His agency was ranked #6 worldwide in the Directory Big Won Rankings in 2014 while Yaish himself was ranked #4 ECD worldwide in 2016 within the same Directory Big Won Rankings. “I grew up learning from AdFest books, back in the day. The festival has always reflected the true passion for advertising in Asia,” said Fadi Yaish. Jimmy Lam, President of AdFest, said that Yaish had continued to raise the benchmark for innovation and creativity in the Middle East year after year. “We are proud to have someone of his calibre guiding this year’s Outdoor & Press jurors,” said Jimmy Lam. If you want to see the work entered and listen to leading professionals from our industry, book your flights and a delegate’s seat soon.